How Much Weight Can A Pregnant Woman Gain? Weight loss after pregnancy is always something every woman is concerned about. But, isn't it normal to gain weight during pregnancy? Weight gain in pregnancy is very important and is an indication of the baby's healthy growth and development. Here are some facts about gaining weight during pregnancy. At birth, the average baby weighs anywhere between 2.8 and 3.3kg. So ideally, you might think that you should gain about the same weight during pregnancy and lose it after delivery. But why do you gain so much more weight during pregnancy? Where does this come from? During pregnancy, the muscle layer of your womb (uterus) grows dramatically and weighs an extra 0.9 kg - 1 kg. The placenta, which helps in nourishment of your baby, weighs just over 0.5 - 0.6 kg. Your breasts weigh an extra 0.4 - 0.5 kg. Your blood volume increases and weighs an extra 1.2 - 1.4 kg. You have extra fluid in your body, and amniotic fluid around the baby, weighing around 2.6 kg. You will also lay down some fat during your pregnancy to provide you with extra energy for breastfeeding. This comes to about 2.5 kg. 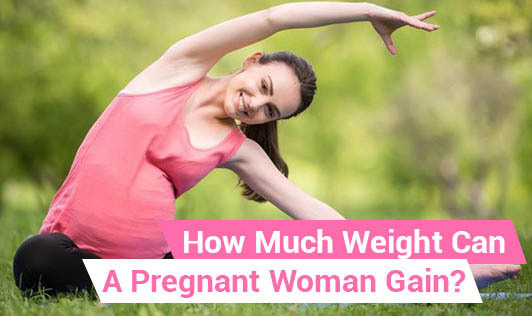 So, totally, you gain around 10.5 to 11.5 kg which is considered healthy during pregnancy, but this is only for those at normal BMI (body mass index). This is considered to be the average weight gain of a pregnant woman. This weight would drastically reduce once after your child birth and during subsequent breast feeding. A woman with a high BMI due to overweight or obesity, should first aim at reducing weight and then plan for pregnancy. But if it was an unplanned pregnancy, then the complications associated with being overweight may increase. The right advice from your doctor, avoiding stress, consuming a balanced diet with the right exercises as per your doctor's advice will help you avoid complications. Women who are underweight should aim at a healthy weight gain and then plan for pregnancy. If the mother is underweight, the baby may lose some nutrients and may be born with a weight lower than normal. Gain healthy and enjoy motherhood!